They proceeded to walk up to the stage and they each picked up an instrument. Each, in his turn, began to play music that they had each written. It was music that opened the heart, touch the soul, and brought half of a full house to tears. These three men, each successful musicians in their own right, have embraced the concept that it takes a village to raise children who are aware, compassionate and kind to others. They all three are living a life full of diversity, as well as fantastic music. They do perform together in Abraham Jam, but each have solo careers. Billy Jonas and David LaMotte are also authors. Each recognizes the power of the others’ religion, and the validity and value of the diverse paths they walk, side by side. Together, they represent the three peoples of the book, and walk — and sing — the talk of diversity, inclusion and brotherly love. Diversity is exactly the concept that world leaders want to push to the back of their agendas, now. The concept of an exclusionary, ethno-centric government is what is being brought to the forefront. Exclusionary governments teach millions of people not to care about “the other”. These three talented, loving men teach the opposite: caring about each other; learning about and from each other is the goal, purpose and higher order of living. When the bus driver on Rosa Parks’ bus threatened to call the police, and have her arrested, her exact words in response were, “you may do that.” There is such power in these few words — claiming her own dignity and acknowledging that each of them had choices to make in that moment, and that those choices would have consequences. That’s true for all of us. My belief is that we must have eco-diversity for Mother Earth to survive, because all forms of nature need each other. Even we need the other forms of life. As human beings, we also need diversity. We need each other, despite having different ways to love; different ways to worship; different views on education; living in different locales and environments; living in different countries. Whatever the differences, how seemingly major, however actually slight, choosing to have different friends, friends who are different from you, is a powerful choice. You may do that. And if you do that, the world will become a better place — more peaceful, more harmonious. More Whole. My hope is that you will constantly open your ears, your heart and your mind to the concept of diversity, and that you will seek it in your own life, every day. In 2011, I was hired, straight out of college, to work at the White House and eventually the National Security Council. My job there was to promote and protect the best of what my country stands for. I am a hijab-wearing Muslim woman––I was the only hijabi in the West Wing––and the Obama administration always made me feel welcome and included. Like most of my fellow American Muslims, I spent much of 2016 watching with consternation as Donald Trump vilified our community. Despite this––or because of it––I thought I should try to stay on the NSC staff during the Trump Administration, in order to give the new president and his aides a more nuanced view of Islam, and of America’s Muslim citizens. When Trump issued a ban on travelers from seven Muslim-majority countries and all Syrian refugees, I knew I could no longer stay and work for an administration that saw me and people like me not as fellow citizens, but as a threat. The evening before I left, bidding farewell to some of my colleagues, many of whom have also since left, I notified Trump’s senior NSC communications adviser, Michael Anton, of my departure, since we shared an office. His initial surprise, asking whether I was leaving government entirely, was followed by silence––almost in caution, not asking why. I told him anyway.I told him I had to leave because it was an insult walking into this country’s most historic building every day under an administration that is working against and vilifying everything I stand for as an American and as a Muslim. I told him that the administration was attacking the basic tenets of democracy. I told him that I hoped that they and those in Congress were prepared to take responsibility for all the consequences that would attend their decisions.He looked at me and said nothing. My parents immigrated to the United States from Bangladesh in 1978 and strove to create opportunities for their children born in the states. My mother worked as a cashier, later starting her own daycare business. My father spent late nights working at Bank of America, and was eventually promoted to assistant vice president at one of its headquarters. Living the American dream, we’d have family barbecues, trips to Disney World, impromptu soccer or football games, and community service projects. My father began pursuing his Ph.D., but in 1995 he was killed in a car accident. My father taught me a Bengali proverb inspired by Islamic scripture: “When a man kicks you down, get back up, extend your hand, and call him brother.” Peace, patience, persistence, respect, forgiveness, and dignity. These were the values I’ve carried through my life and my career. I never intended to work in government. I was among those who assumed the government was inherently corrupt and ineffective. Working in the Obama White House proved me wrong. You can’t know or understand what you haven’t been a part of. Still, inspired by President Obama, I joined the White House in 2011, after graduating from the George Washington University. I had interned there during my junior year, reading letters and taking calls from constituents at the Office of Presidential Correspondence. It felt surreal––here I was, a 22-year-old American Muslim woman from Maryland who had been mocked and called names for covering my hair, working for the president of the United States. While cognizant of the possibility of Trump winning, I hoped a majority of the electorate would never condone such a hateful and divisive worldview. Then, on election night, I was left in shock. The morning after the election, we lined up in the West Colonnade as Obama stood in the Rose Garden and called for national unity and a smooth transition. Trump seemed the antithesis of everything we stood for. I felt lost. I could not fully grasp the idea that he would soon be sitting where Obama sat. I debated whether I should leave my job. Since I was not a political appointee, but a direct hire of the NSC, I had the option to stay. The incoming and now departed national security adviser, Michael Flynn, had said things like “fear of Muslims is rational.” Some colleagues and community leaders encouraged me to stay, while others expressed concern for my safety. Cautiously optimistic, and feeling a responsibility to try to help them continue our work and be heard, I decided that Trump’s NSC could benefit from a colored, female, hijab-wearing, American Muslim patriot. Placing U.S. national security in the hands of people who think America’s diversity is a “weakness” is dangerous. I might have lasted a little longer. Then came January 30. The executive order banning travelers from seven Muslim-majority countries caused chaos, without making America any safer. Discrimination that has existed for years at airports was now legitimized, sparking mass protests, while the president railed against the courts for halting his ban. Not only was this discrimination and un-American, the administration’s actions defending the ban threatened the nation’s security and its system of checks and balances. Alt-right writers, now on the White House staff, have claimed that Islam and the West are at war with each other. Disturbingly, ISIS also makes such claims to justify their attacks, which for the most part target Muslims. The Administration’s plans to revamp the Countering Violent Extremism program to focus solely on Muslims and use terms like “radical Islamic terror,” legitimize ISIS propaganda and allow the dangerous rise of white-supremacist extremism to go unchecked. Placing U.S. national security in the hands of people who think America’s diversity is a “weakness” is dangerous. It is false. People of every religion, race, ethnicity, sexual orientation, gender, and age pouring into the streets and airports to defend the rights of their fellow Americans over the past few weeks proved the opposite is true––American diversity is a strength, and so is the American commitment to ideals of justice and equality. American history is not without stumbles, which have proven that the nation is only made more prosperous and resilient through struggle, compassion and inclusiveness. It’s why my parents came here. It’s why I told my former 5th grade students, who wondered if they still belonged here, that this country would not be great without them. It is the last day of the Jewish calendar. Tomorrow begins Rosh Hashanah, the Jewish New Year. This article is an important one for Jews and non-Jews around the world to read. “Extreme polarization around issues facing Israel is one of the most difficult challenges our Jewish communities in North America face. On the one hand, there is a great desire among Jews to feel a sense of peoplehood or family resemblance, a set of principles, values and identifiers which connect us to one another. Until a number of years ago, one could say that participating in the revitalization of the Jewish people in the State of Israel was one of those core values. Despite deep differences in theology, culture and ritual practice, most of the Jewish world cried together when Israel hurt and rejoiced together when Israel prevailed. On the other hand, the narrative of Israel around which North American Jews rallied had been a somewhat idealized one: one which promised that Jewish sovereignty would look different from the nations of the world. We were captivated by the notion that we might fulfill the Herzlian dream of Israel as a model nation-state to the world, emanating light, peace and unity of all peoples. Planting a tree in Israel was like planting a little bit of our souls in its soil. And there was no purer, sweeter place to breathe the air of being Jewish. If this was the content of why Israel became a powerful “religious” nation in the 20th century, an emerging feature of 21st century Jewry is a growing fragmentation of the narrative. For some North American Jews, there is a growing discomfort with the direction Israel is heading as it confronts its geopolitical and internal realities. For them, today’s Israel isn’t fulfilling her mission of being a state that reflects their most previous values, responding to its challenges instead in ways that mystify their Jewish consciences. Others remain stalwart in seeing Israel’s growth and development as a nation over the decades as nothing short of a political, religious, technological and economic miracle despite overwhelming challenges to its survival. Not only that, in a world with anti-Semitism on the rise, supporting Israel as a safe haven for the world’s Jews feels essential. For their friends or family members to speak of Israel’s failings mystifies their Jewish conscience. They might expect those views from people outside of the Jewish community or from anti-Semites, but it is nothing short of betrayal coming from one of “us.” There doesn’t seem to be a middle ground on this point: one is either loyal to Israel, or a self-hating Jew. Pope Francis and leaders of other world religions said “No to War!” on Tuesday, vowing to oppose terrorism in God’s name and appealing to politicians to listen to “the anguished cry of so many innocents”. Francis flew by helicopter to the central Italian hilltop city that was home to St. Francis, the 13th century saint revered by many religions as a patron of peace and nature and a defender of the poor. The head of the Roman Catholic Church closed a three-day meeting where about 500 representatives of Christianity, Islam, Judaism, Buddhism, Hinduism, Shintoism, Sikhism, Zoroastrianism and other faiths discussed how their members could better promote peace and reconciliation. Francis, who delivered two addresses and shared meals with the leaders, said indifference to suffering had become “a new and deeply sad paganism” that caused some to turn away from war victims and refugees with the same ease as changing a television channel. Near the end of the gathering, members of each religion prayed in a separate locations and then joined each other in a square outside the famous pink stone basilica where St. Francis is buried. Prayers were said for the victims of war, including in Syria and Afghanistan, and for the refugees fleeing the conflicts. A woman refugee from Aleppo now living in Italy told the pope at final gathering “my heart is in tatters”. “Only peace is holy, and not war,” the Argentine-born pontiff said. Francis, leader of the world’s 1.2 billion Roman Catholics, prayed in the basilica with Archbishop of Canterbury Justin Welby, spiritual leader of the world’s 80 million Anglicans, and Patriarch Bartholomew, spiritual leader of up to 300 million Orthodox Christians around the globe. “No to war! May the anguished cry of the many innocents not go unheeded. Let us urge leaders of nations to defuse the causes of war: the lust for power and money, the greed of arms’ dealers, personal interests and vendettas for past wrongs,” the appeal said. The narrow, cobblestone paths of Assisi echoed with the sound of different languages when Shinto priests in red-and-white robes crossed paths with rabbis in black and Muslims in white as each group converged outside St. Francis Basilica to join the Christians. Speaking during the Christian service, Francis said the world could not ignore “our brothers and sisters, who live under the threat of bombs and are forced to leave their homes into the unknown, stripped of everything”. “Who listens to them? Who bothers responding to them? Far too often they encounter the deafening silence of indifference, the selfishness of those annoyed at being pestered, the coldness of those who silence their cry for help with the same ease with which television channels are changed,” he said. The event was held to mark the 30th anniversary of the first such encounter hosted by the late Pope John Paul in 1986. The Dalai Lama is the Spiritual and Political leader of Tibet. When he was 15, the Chinese came in the night and stole Tibet from the Tibetan people.The Dalai Lama was smuggled out with many residents into India. The Chinese stated that Tibet belongs to them and the world just let them take it. I have met the Dalai Lama in the late 1980’s. I read a lot of his books. His energy is gentle. He is witty and forgiving. He has a deep thirst for knowledge. The Chinese raped and killed many monks and nuns who stayed in Tibet. Chinese people were brought in to intermarry with the Tibetan people who had chosen to remain in their country of birth. Now their children are Tibetan and Chinese. The Dalai Lama is a man working for peace and non-violence. Even though the world did not reach out a hand to stop the Chinese, he has forgiven them all. He wrote letters to all the world leaders asking for assistance getting his country back. Not one offered to help. His political headquarters is still in India and even today, Tibetans climb down the mountains and go into India to get away from the Chinese way of life which is not theirs. The world didn’t offer to help because Tibet had nothing the world wanted, no oil, no uranium, no diamonds. So we let China take the home of these non- violent people. Today the Dalai Lama travels the world giving talks about peace. He is warm and charming. When he dies, they will begin looking for the new Dalai Lama after eighteen months. Once recognized, the new Dalai Lama will be trained to be the new Spiritual and Political leader of Tibet. My hope is that this Dalai Lama lives for quite a while yet. Blessings on his name. A vast 83 percent of Americans say the next president should place an “especially major” focus on trying to improve race relations – which, following the Dallas police killings and high-profile shootings of blacks by police, majorities see as bad and getting worse. 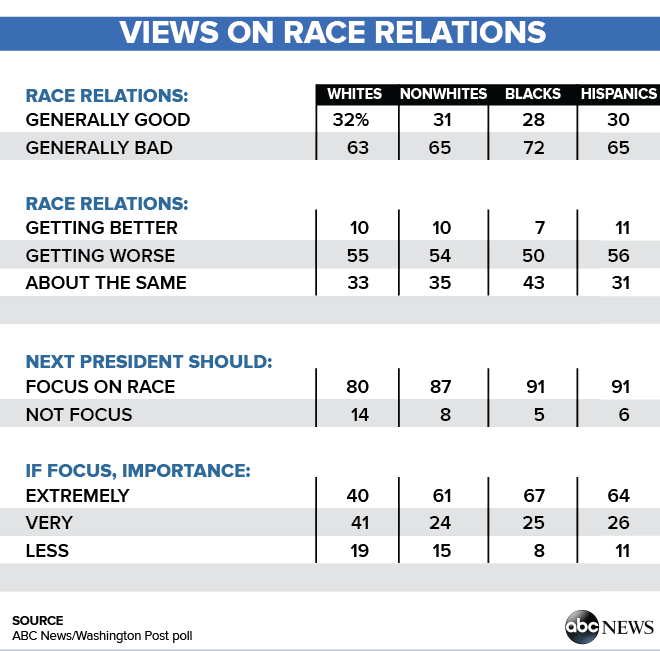 Sixty-three percent in a new ABC News/Washington Post poll say race relations generally are bad and 55 percent say they’re worsening, sharply more negative views than just two months ago. 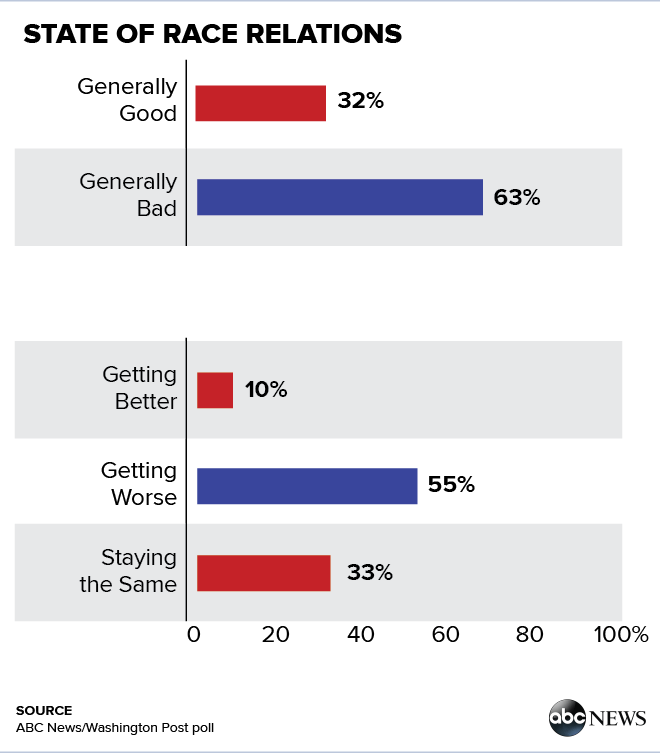 Only a third say relations are good and just one in 10 say they’re getting better. This translates into a broad desire for progress. Not only do 83 percent say the next president should put an especially major focus on trying to improve race relations, nearly half in this group also say it’s “extremely” important. Just 12 percent don’t want a major focus on the issue, and few of them feel strongly about it. To the extent race relations influence the presidential campaign, Hillary Clinton may benefit: the public trusts her more than Donald Trump to handle the issue by 58 to 26 percent, with Clinton preferred by 89 percent of Democrats, 55 percent of independents and a quarter of Republicans. She also leads Trump by 66-21 percent on the issue among those who think the next president should focus heavily on race relations. Clinton-Trump gaps on race relations span racial groups in this poll, produced for ABC byLanger Research Associates. Though her advantage expands to 74-12 percent among nonwhites (a broadly Democratic group), Clinton also leads Trump on the issue by 15 points among whites, 50-35 percent. Among whites who think relations are deteriorating, though, Trump’s trust deficit with Clinton disappears. Seventy-two percent of blacks, 65 percent of Hispanics and 63 percent of whites say race relations currently are bad. Half of blacks, and 55 and 56 percent of whites and Hispanics, respectively, also say they’re getting worse. Blacks and Hispanics are 11 points more apt than whites to say the next president should put a major focus on the issue. But the big difference is in how many call this extremely important: Just 40 percent of whites who favor a major focus on race relations, vs. 67 and 64 percent of blacks and Hispanics, respectively. Pessimism about race relations is higher among young adults, 73 percent, compared with 61 percent of those older than 29. Americans without a college degree are 10 points more likely than those with a college degree to think relations are poor and 14 points more likely to think the situation is getting worse. Both groups contain higher shares of minorities. City dwellers are 10 points more likely than rural residents to view relations as generally poor, but the latter are 9 points more apt to think things are getting worse. And women are 8 points more likely than men to think relations are worsening. Democrats and liberals both split on whether race relations are getting worse or merely staying the same. By contrast, majorities of independents and moderates – as well as about two in three Republicans, conservatives and evangelical white Protestants – think relations are declining. In the largest political difference, four in 10 liberal Democrats think race relations are worsening (a plurality says they’re staying the same), compared with two-thirds of conservative Republicans. That said, improving race relations is a bigger priority for Democrats and liberals; more than nine in 10 say the next president should be someone who puts a major focus on the issue, and among them, six in 10 say it’s extremely important. While three-quarters of Republicans also favor a major focus on race relations, only 35 percent say it’s extremely important. Peace is what most of us want. Peace is what we need. One of the things we need to bring about peace is to end all racism. I didn’t used to think racism remained a real problem. I worked with people of color, volunteered with them and envied their ready-made tans. But as time has gone on I have realized that other Caucasian people felt differently. With the election of Obama and the re-election, I realized that I was different from most Caucasians that I knew. Now I am speaking up about race relations and I am sorry for all the innocent lives of color that have been lost. Black people have a right to worry about their children. So do Muslim parents, Asian parents and indigenous parents. Bob Marley was right. There is One Family, One Love, and One World. If we destroy it, we are all responsible; if we heal it and ourselves we all get credit. May peace be the word you wake up to in the morning and the last word you think of before you go to sleep.